“For an artist who so consistently sought to objectively portray everyday nature as filtered through photography, the iceberg paintings hold a special place among Richter’s landscapes, coming closest to the transcendental sublime of 19th century German Romanticism. In the short time I’ve been lucky enough to live with this painting, I’ve been truly fascinated to see its colours change every day – sometimes glowing and warm, sometimes icy cold. It’s a painting that never stands still” commented Alex Branczik, Head of Contemporary Art, Sotheby’s Europe. 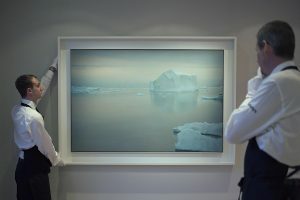 Estimated at £8 – 12 million / HK$76.8 – 115.2 million, Eisberg is the largest of only three Iceberg paintings made by Richter. The second work is held in the prestigious collection of Doris and Donald Fisher that is promised to the San Francisco Museum of Modern Art. A third work, Eis (1981) sold at Sotheby’s London in February 2012 for £4.3 million. This one is estimated at £8-12 million. This entry was posted on Friday, February 3rd, 2017 at 9:03 am	and is filed under ART, AUCTIONS. You can follow any responses to this entry through the RSS 2.0 feed. You can leave a response, or trackback from your own site. mark the reference of each and every paint.